Our remote management board RM23 is now in production and ready for delivery ! Our OPMA2368 boards are ready ! This is a SODIMM form factor (2.66" x 1.42" / 68mm x 36mm) daughtercard that conforms to the AMD Open Platform Management Architecture (OPMA) m2 specification for motherboard management. OPMA2368 module provides a drop-in solution for motherboard and system management and plugs in to our System Development Board. Check out the data sheet. Our remote management board RM2364 is now production ready ! This is a beauty, jam packed with everything you need for remote management and tracking. It's got an LPC2364 ARM processor and runs coreIPM software. 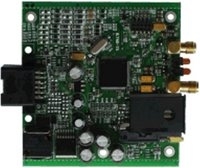 Includes a tri band GSM/GPRS (900-1800-1900) modem. 20 channel SiRFstarIII GPS. CAN bus, Li-Ion battery charger, runs off +6....32 VDC and much more! We're shipping the first batch in September. We now have an AMC dev board (ADB1) for sale. This is a small card with an AMC card edge connector that accepts an Olimex LPC2148 header dev board. We're making a pre production batch available for early adopters. (http://www.coreipm.com/boards to purchase). We've completed the layout design for our LPC2368 based OPMA2368 management board (shown close to full size on the left) and are expecting the first set of boards back from the PCB manufacturer. We'll be using this for OPMA, uTCA & ATCA shelf management and ATCA blade management functions. The System Development board SD1 layout is almost complete. This is available as a test setup, a development board or a backplane for building an inexpensive uTCA chassis. coreIPM project (www.coreipm.com) announces the beta release of its AdvancedMC Module Management Controller (coreIPM-MMC) software. coreIPM-MMC is a free and open source, full spec compliant software that provides management functions for AMC cards. The PICMG® Advanced Mezzanine Card™ (AdvancedMC or AMC) is a small form factor mezzanine / blade card for AdvancedTCA® Carriers and PICMG® Micro Telecommunications Computing Architecture (MicroTCA™) systems. coreIPM-MMC provides monitoring, control and inventory tracking functions. It can monitor sensors such as those for temperature and voltage and can generate alerts. Control functions enable power control and resets. Inventory tracking makes field replaceable unit data available for management. Hot swap capability allows insertion and removal from a live chassis. coreIPM-MMC integrates all system management functions into an off-the-shelf single chip microcontroller. 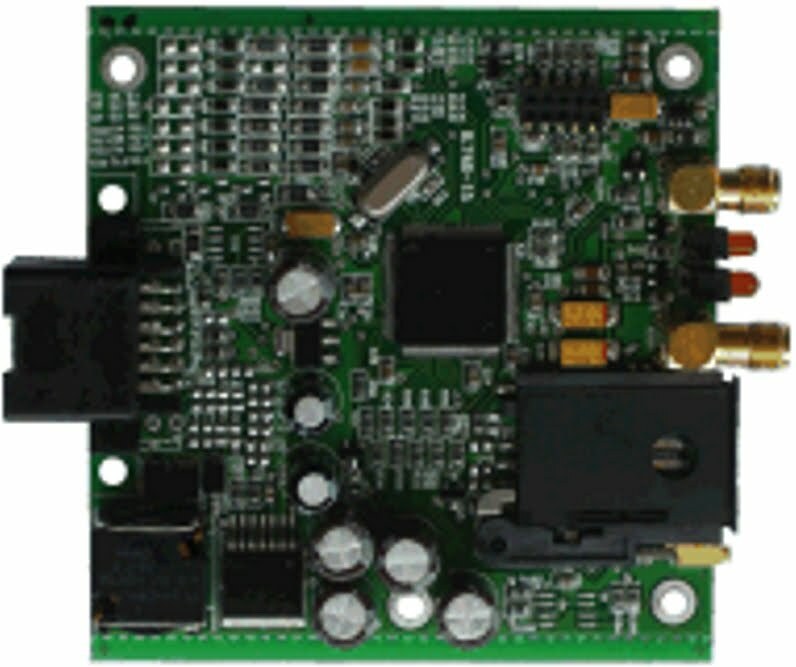 coreIPM-MMC currently supports the NXP 32-bit LPC2000/2300 microcontroller family based on the ARM7 core. The project supports multiple sets of development tools including gcc and commercial compilers and debuggers from multiple vendors. JTAG support enables program downloads and on-chip debugging. coreIPM-MMC is one of the components of the coreIPM management architecture. Other components of coreIPM provide management capability for elements of the ATCA and MicroTCA environment such as ATCA carriers, Cooling Units, Power Modules, MicroTCA Carrier Managers and Shelf Managers. Source code is available under the Open Source GNU General Public License (GPLv2) and commercial licensing. coreIPM project has full ownership of the source and can provide alternative licensing. Commercial licensees get a commercially supported product without a requirement that their coreIPM based software be open sourced. coreIPM project (www.coreipm.com) announces the initial alpha relasease of coreBMC, its baseboard management controller firmware. coreIPM is an open source management architecture for hardware that can range from an individual board to more complex configurations that can be made up of any combination of boards, blades, standards-based modular platforms, appliances, enclosures, and multiple enclosure aggregations. coreIPM is based on the Intelligent Platform Interface Management (IPMI) standard v2.0 with PICMG 3.0 R2.0 AdvancedTCA extensions. The Intelligent Platform Management Interface (IPMI) is an open standard platform management specification. AdvancedTCA (ATCA) is a series of industry standard specifications for carrier grade communications equipment. coreBMC provides monitoring, control and inventory tracking functions. It can monitor sensors such as temperature, voltage, fan operation, power supply, security, hardware errors and provide logging and alerts. Administrators can get notified on exception conditions even if the payload operating system is non-responsive or the payload is powered down. Hardware health condition monitoring and can also automatically take actions such as a graceful system powerdown when a temperature threshold is exceeded. Control functions enable power control, resets and backplane fabric attachment. Inventory tracking makes field replaceable unit data available for management. 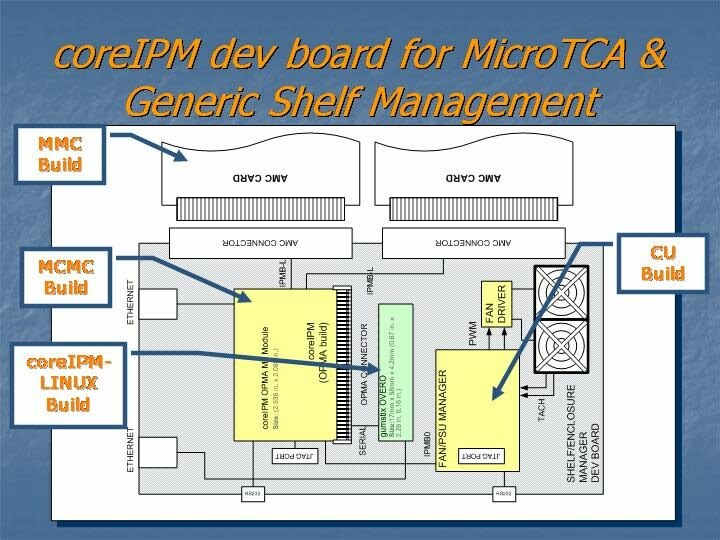 coreIPM architecture is comprised of the coreBMC (Baseboard Management Controller) and coreSMC (Shelf Management Controller) software modules. coreBMC is fully sufficient by itself to provide board & appliance/enclosure management functions over serial lines or TCP/IP. Coupled with coreSMC it’s possible to build shelves and higher hardware hierarchies such as an ATCA blade chassis. coreBMC is independent of a main motherboard processor (the payload or host) and its peripherals, BIOS, OS, payload power and system management software that runs on the payload processor. It provides in-band access to management functions at all times. coreBMC can be built into a motherboard, a blade carrier, a shelf manager or packaged in an OPMA module. 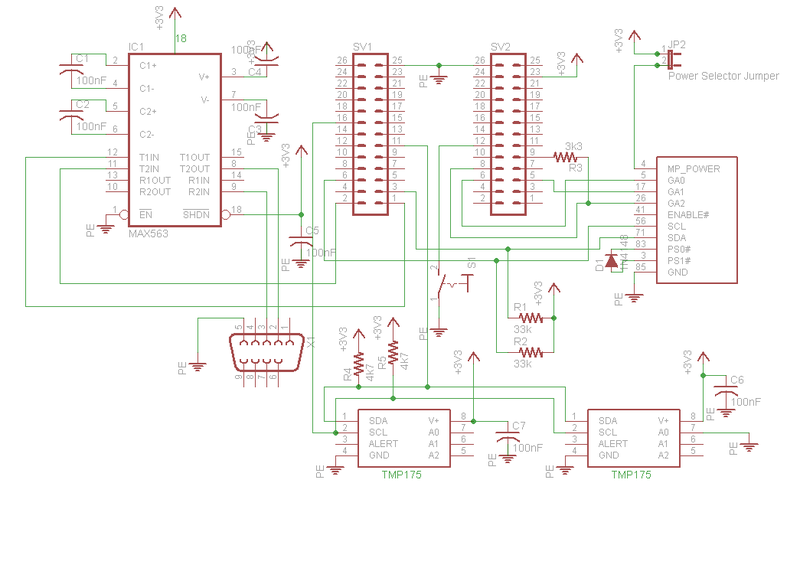 Its small footprint is designed to be embedded in a microcontroller. The coreSMC component is UNIX/LINUX based and is compliant with the shelf management requirements of the AdvancedTCA specification. coreBMC provides the front-end hardware interfaces to the coreSMC in a shelf management configuration. coreBMC is initially supported on ARM based microcontrollers. Source code is available under the Open Source GNU General Public License (GPLv2) and commercial licensing. Commercial licensees get a commercially supported product without a requirement that their coreIPM-based software be open sourced. For more information, visit www.coreipm.com.